I really didn’t want to post another article about the dysfunctional Trump family today, but I just finished reading this and I think it’s too important to pass by. The writer of this post has autism and was raised by NPD parents who kept him isolated and alone. 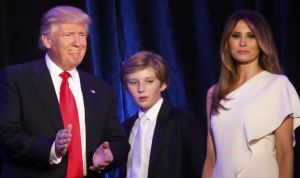 Here he discusses Barron Trump and how being isolated alone on his own floor of the Trump tower is very toxic for his emotional development, especially if he in fact suffers from autism, as many people have speculated. Rick makes a case here that such isolation is a form of scapegoating or abusing a child, and if Barron is autistic, it would make sense that his father would target and punish him for being less than perfect. My verbal processing problems and not getting jokes. .
Today a co-worker told me why people tend to not respect me and why they talk down to me. I already knew the reasons why, but hearing it from another person, even when it’s not said in a mean or patronizing way, still stung a lot. She said when people talk to me, I seem to not understand what they are saying, and I don’t process verbal directions as well as most people. Unfortunately, what she said is absolutely true. Even though I know I’m well above average intelligence, I’ve always been sensitive about this and afraid people will think I’m stupid because of this problem I have processing verbal communication. This is typical of someone with Aspergers or autism, and I also suffer from the social awkwardness of an Aspie. Both result from failing to process verbal communication in a normal (some would say “neurotypical”) way. 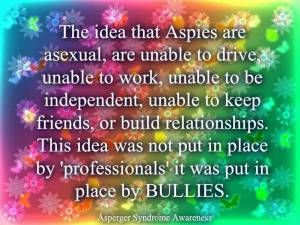 Although I was never diagnosed with Aspergers, for many years I was sure I had it, because I certainly act and think in Aspie-like ways. I’ve had this problem since childhood. There’s never been any proof I don’t have Aspergers though, so who knows–I could be on the autism spectrum. But I actually think my problem is due to complex PTSD mixed with Avoidant Personality Disorder. I’m usually slightly dissociated or “off in space” somewhere when people are telling me things. I also am highly uncomfortable in groups of other people (or people I don’t know well) and the ensuing self-consciousness makes me clam up and do and say awkward things. I can’t really focus on what others are saying because I’m so obsessed with not looking stupid or weird. I get so nervous that I might not understand what the other person is telling me, that my brain stops working and makes the problem even worse. The fact I also have very poor hearing (I only have 20% hearing in my left ear) exacerbates this problem. I have a similar problem when people are telling me jokes. I’m so afraid I “won’t get it” that instead of listening to the joke, I’m worrying that I might not get it and the person telling the joke will think I’m stupid. So what happens? Ding ding ding! I don’t get the joke! That’s why I prefer jokes that don’t require any “getting.” Goofy or silly humor, or “random” humor is much more my speed. My malignant narcissist ex used to exploit my discomfort with joke-telling for his own sadistic entertainment. He did this by deliberately telling long, involved jokes when others were present, and then pointedly look at me, asking, “Did you GET it?” If I didn’t (which was often the case when I was put in this nerve-wracking situation), I could do one of two things: (a) I could lie and say I did get it, but this didn’t work because he’d then ask me to explain the joke; or (b) admit I didn’t get it. Either way, he was turning my insecurities against me in order to make me appear stupid in front of others. He’d rub salt in the wound by telling me I had no sense of humor because I was unable to get his jokes, even though this actually isn’t true at all and I think I have a very well developed sense of humor (just not a traditional one) and many people find me funny. What that sociopath did was an especially subversive and vicious form of gaslighting that exploited my differently-wired brain and my self-consciousness. I still find situations where people are telling jokes very triggering. 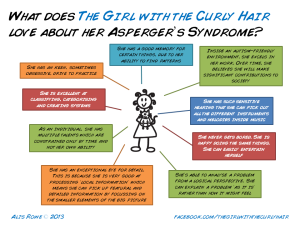 How does Aspergers Syndrome differ from Non-Verbal Learning Disability (NVLD)? I never heard of Non-Verbal Learning Disability (NVLD) until last night, when I was reading Nyssa’s Bio (on her blog Nyssa’s Hobbit Hole), where she said she suffered from NVLD, which is very similar to Aspergers Disorder but not quite the same thing. Some mental health professionals believe NVLD is actually part of the autism spectrum, higher functioning even than Aspergers. Aspergers itself could be thought of as a social learning disability. I decided to find out more about what this disorder and what the differences are, and I came across this well written article, and decided it belonged here too. How Are These Two Disorders Related to Each Other? There is clearly a great deal of overlap between Aspergers Disorder (AD) and Nonverbal Learning Disabilities (NVLD), so much so that it is possible that the symptoms of each describe the same group of children from different perspectives—AD from either a psychiatric/behavioral perspective, and NVLDneuropsychological perspective. The specific conventions of these diagnoses may lead to a somewhat different group of children meeting diagnostic criteria, but it is not clear that this reflects something “true” in nature. That is, it may only be convention that separates these two groups. One is reminded of the story of the six blind men who were asked to describe an elephant. Each man grabbed a different part of the creature (the snake-like trunk vs. the tree-like leg) and gave an accurate description from his own particular perspective—but each man thought the others were completely mistaken! Studies conducted by the Yale Child-Study Group suggest that up to 80% of children who meet the criteria for AD also have NVLD. While there are no studies on overlap in the other direction, most likely children with the more severe forms of NVLD also have AD. Children from both groups are socially awkward and pay over-attention to detail and parts, while missing main themes or underlying principles. However, by convention, the two groups differ in the range of severity. Professionals reserve an AD diagnosis for children with more severe social impairment and behavioral rigidity; some symptoms may overlap with high functioning autism. There are degrees of severity within AD but not to the extent that is acceptable in diagnosing NVLD. These degrees can range from extreme autistic behavior to cases where the social difficulties are very subtle and the academic/cognitive difficulties are more prominent. Here is a brief outline of the diagnostic criteria for AD and the pattern of neuropsychological finings in NVLD. While the overlap is apparent, the emphasis is different because criteria for NVLD focuses on academic issues as well as specific test findings and is not purely descriptive. This also results in different means of making the diagnosis (testing or observing). B. Restricted, repetitive and stereotyped patterns of behavior, interests, and activities. C. These problems taken together (A plus B) result in significant challenges in the lives of people with AD as they attempt to live in a neurotypical world and meet the expectations of others. D. There is no general language delay. E. There is no severe global cognitive impairment. A. NVLD can be conceptualized as an imbalance in thinking skills—intact linear, detail oriented, automatic processing with impaired appreciation of the big picture, gestalt or underlying theme. 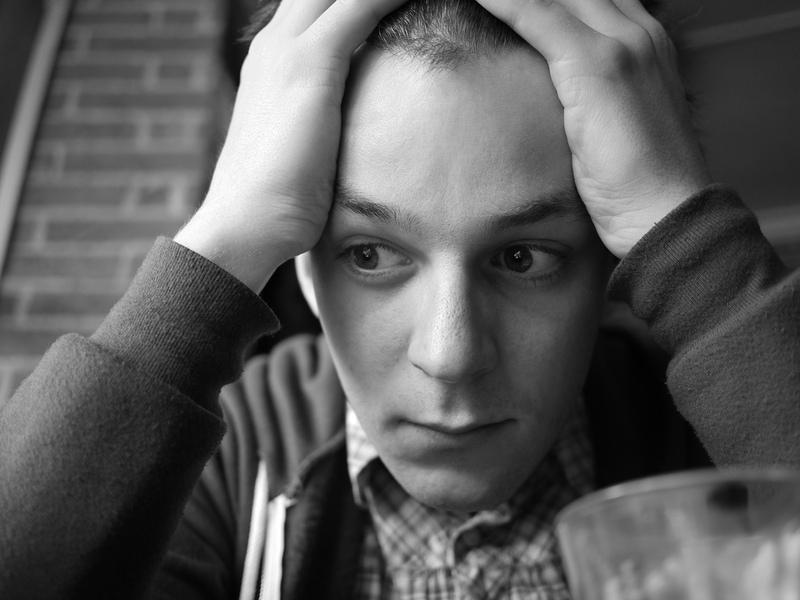 C. Typically social/psychiatric concerns are raised before academic problems are identified. D. While the overlap is not complete, NVLD children may meet the criteria for Pervasive Developmental Disorder Not Otherwise Specified (PDD NOS), Aspergers Disorder, or Schizotypal Personality. –Visual spatial deficits are most pronounced: poor appreciation of gestalt, poor appreciation of body in space, sometimes left side inattention/neglect, may have highly developed but ritualized drawing skills that are extremely detail oriented. –Rote linguistic skills are normal (i.e. repetition, naming, fluency, syntactic comprehension), but pragmatic use of language is impaired: weak grasp of inference, little content, disorganized narrative despite good vocabulary and grammar. Rote recall of a story may be good, but the main point missed. Rhythm, volume, and prosody of speech are often disturbed. –Motor and sensory findings are common: usually poor fine and gross motor coordination, left side worse than right. –Attention is usually reported to be impaired and testing supports this, but the affect is desultory as opposed to distractingly impulsive, as in ADHD. It is as if people with NVLD do not know what to attend to, but once focused, can sustain attention to detail. The distinction between figure and ground is disturbed, resulting in attention errors. –Difficulties are often picked up late because decoding and spelling may be quite strong. –Inferential reading comprehension is weak relative to decoding and spelling skills. –Math is often the first academic subject to be viewed as problematic. Spatial and conceptual aspects of mathematics are a problem; math facts may be readily mastered. I.e., a student may know the answer to a simple multiplication problem, but not understand what multiplication is. –Due to spatial and fine motor problems, handwriting is usually poor. –Organization skills are weak, particularly in written work. –Peer relations are typically the greatest area of impairment; may play with much older or younger children than with same age peers where they must manage give and take. –They often lack basic social skills; may stand too close, stare inappropriately or not make eye contact, have marked lack of concern over appearance, be oblivious to other’s reactions, change topics idiosyncratically. –They may show poorly modulated affect, not matched to verbal content. –Lack of empathy and social judgment may shield them from fully experiencing the hurt of peer rejection, while the same factors increase the likelihood of being rejected. –History of unusual thinking can often be obtained: rituals, stereotypic behaviors, rigid routines, and magical/bizarre beliefs. 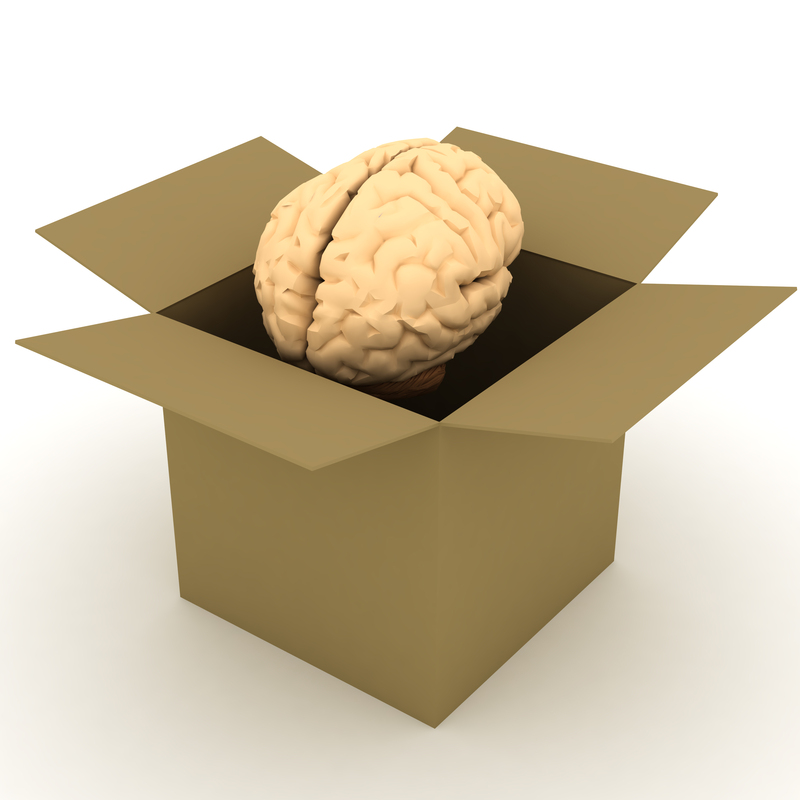 NVLD should be diagnosed in the context of a comprehensive neuropsychological evaluation. It is not simply a matter of Performance IQ being less than Verbal IQ, since there may be many reasons for such a discrepancy besides NVLD. Furthermore, NVLD can be present even if no discrepancies between strong verbal ability and poor performance show up on the Weschler Intelligence Scale for Children (WISC-III). One does not need to have every characteristic of NVLD in dramatic form for the diagnosis to be helpful in delineating the pattern of strength and weaknesses. NVLD can be complicated by an array of psychiatric and social/familial problems, so it is important to assess the whole child-world system, not just the cognitive status. AD is best diagnosed from a detailed history, school reports, and observing the child. As parents vary in how they report symptoms, one good marker is whether or not the child had engaged in symbolic play as a toddler. Children with AD tend not to play with toys as the “thing” they represent. For example, they may collect fire trucks but not play “fire.” Parents may also report that their children use language instrumentally, rather than using it to trade ideas. The children do not seem to consider that the “other” may have different ideas. Because AD is diagnosed descriptively, one does not need neuropsychological testing to diagnose it. However, since there is so much overlap between AD and NVLD, neuropsychological testing is strongly recommended. Testing will identify any specific interference with academic functioning, and confirm imbalances in thinking skills that may have been observed. In my practice I have seen a number of children with AD who would not meet the criteria for NVLD in any existing research studies. If these children had participated in the Yale study mentioned earlier in this article, they would probably have been in the 20% of the AD children who did not meet the NVLD criteria. It is possible that the AD children in that 20% may have had very high visual spatial scores, thus masking their over-attention to detail in problem solving. For example, they may have scored very high on the Block Design subtest of the IQ measure (using colored blocks to match a pattern given to them) with little or no appreciation of the gestalt. Their considerable skill and speed at analyzing detail would have allowed them to use this inefficient strategy effectively. With these very bright children, it may be that the tests are not sufficiently sensitive to discern a pattern of NVLD. On the other hand, some children with AD show diffuse difficulties in the language and attention domain, but may not exhibit the pronounced discrepancies associated with NVLD. Nonetheless, they may still struggle with the cognitive difficulties of NVLD. Conversely, a child meeting the criteria for NVLD, may not meet the criteria for AD, even though subtle characteristics of the disorder may be present. A case example best illustrates how children who clearly have NVLD may not meet the criteria for AD as it is presently understood. I evaluated an eighth grade girl whose parents were concerned about her math performance. She had above average overall ability, but a 24-point discrepancy between her verbal and visual spatial skills on the IQ measure. On the neuropsychological measures, she clearly had the pattern of visual spatial deficits, left sided motor slowing, and poor math ability, while language skills were intact. She did not have any problems with inferential comprehension in reading. One would not even have considered Aspergers Disorder. She had had many good friends through elementary school and felt herself to be part of her peer group. Symbolic play development had been normal and she exhibited no repetitive behaviors. This is unusual in NVLD as well, but since much of the criteria for this neuropsychological diagnosis is cognitive and test-based, it was determined that she met enough of the criteria for a diagnosis of NVLD. I commented in the report that, unlike this girl, most children with NVLD have more social problems, tend to miss the point in social interactions, and have trouble in content areas in school because of inferential reading comprehension problems. The parents came back to me when she was a senior. She was now isolated from her peers, who complained that she was too literal. Now she was struggling in literature and social studies; her papers tended to be more like lists and less integrated than those of her peers. I don’t believe she was developing a new disorder. She had a classic NVLD, but it was relatively subtle and it required more high-powered peer and academic demands to highlight her social perception and inferential reasoning weaknesses, much the same way that some mildly dyslexic individuals compensate reasonably well and go unnoticed until they flunk out of their first year of college. Given her history of good social adjustment, one would still never diagnose her with AD. One has to wonder whether her neurcognitive functioning indicated AD, but in a much milder form. 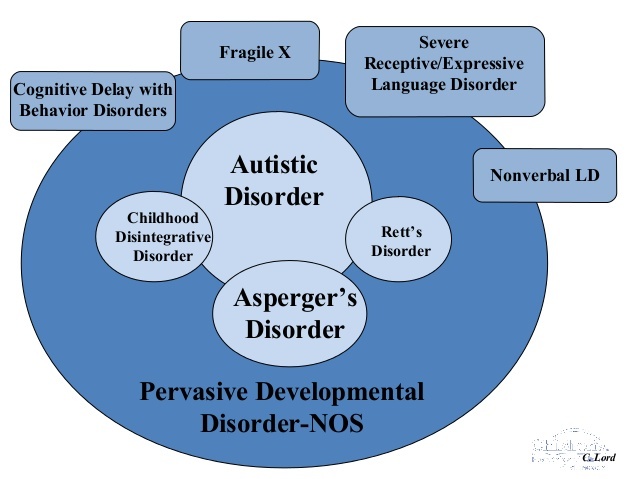 Asperger’s Disorder was not originally thought of as having a continuum of severity that included these subtle forms, whereas NVLD did not start with the assumption of more extreme difficulties. 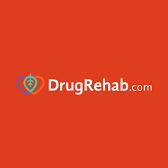 As information about AD becomes more widely circulated more and more subtle cases are being identified and the culture is, in some manner, changing the original “intention” of the category. While that may dilute the meaning of the diagnosis, it will more accurately reflect the variety of developmental presentations in nature. As humans, we naturally want to categorize. The complex relationship between NVLD and AD may be an example of categorizing how too rigidly can confuse, rather than clarify, our thinking. Dr. David Dinklage is Director of Neuropsychology at Cambridge Hospital, and has a private practice in Belmont. 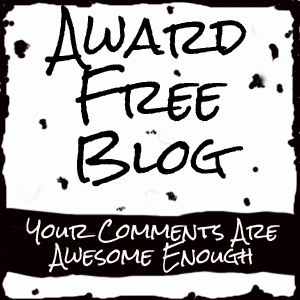 Gale Molinari http://www.galesmind.com just wrote an amazing article about her Aspie friends, where she points out the ways Aspergers has made these two women even better friends to her than they might otherwise be. It’s so wonderful to see someone write about the positive aspects of Aspergers and how this “mental disorder” gives its “victims” a depth and understanding and focus neurotypicals do not have. There is a growing community of people with Aspergers who have started an “Aspie rights” movement who’s aim is to get Aspergers removed from the DSM and psychiatric and medical literature as a mental illness and also lobbies for it to stop being considered a handicap, disability, or even a form of mental retardation (which its more severe forms are often confused with). Aspies are not retarded. They also lobby for a more Aspie-friendly world, where for instance, instead of a face to face interview for a job, another kind of application system, such as a Instant Message interview or a written essay can better serve an Aspie applicant and show a potential employer their true talents. Many if not most Aspies have brilliant minds and high intellectual capacity but can do little or even nothing with their minds because in order to get ahead in the western world (things apparently are easier for Aspies in places like Japan, which doesn’t rely on social gregariousness and aggression), a person must have great social skills and the ability to “think on their feet,” “network” and “schmooze” with higher ups–and always know the right thing to say at the right time. 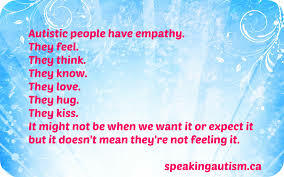 Aspies have difficulty doing these things, and can come off as awkward, weird, lacking affect, painfully shy, lacking empathy (see my rant about THAT! ), or even “slow,” so they are often overlooked for promotions or higher level work. Many people assume because they don’t communicate well verbally and sometimes seem lost in their own world, that they are stupid. But that is just one big fat lie. Even low functioning people with autism –the ones who have to be institutionalized and cannot care for themselves (and are what most people still think of when they think of autism)–are probably extremely intelligent–but have focused ALL their attention and thinking on ONE OR TWO THINGS. They may be focusing so intensely on their topic of fascination and encyclopedic knowledge (the so-called “idiot savant” phenomenon) to the point they literally are not living in the physical world and must be cared for by others. Higher functioning people with autism (Aspies) still tend to focus intensely on things and can become obsessed (to a point neurotypicals find weird or unhealthy) with whatever fascinates them. They hate to be interrupted by outside things or people when mentally engaged in their interests or hobbies. But since their autism is much less severe, they can still attend to the outside world if they must. But they aren’t very good at it and prefer not to. Most Aspies were also bullied as children due to their differences and lack of ability to socialize the way others do (and their high sensitivity), and may have been bullied by their own families (especially if, as I did, they had one or more narcissistic parents or siblings) and frequent bullying can destroy any self esteem a child with Aspergers may have, making things even harder for them when they try to get a foothold in the professional world as adults. Studies have shown that high self confidence is a far better indicator of adult success in life than high intelligence is. Ever wonder why your boss is stupider than you are? Maybe he just likes himself more than you like yourself. This is why narcissists (except the needy type, who thrive on pity and handouts) usually do so well in the working world (though they fail miserably on the relationship/family front). Some of the most brilliant people in history have had Aspergers (Einstein himself) and were thought to be unintelligent as children because of their slowness in learning social skills. Einstein didn’t talk until he was 3 and his teachers thought he was retarded. Anyway, my point is, because of the Internet (on which Aspies thrive–more so than in the physical world; see my article “Aspies Rule the Internet”), Aspergers is slowly losing its status as a mental illness and being recognized as a variation, much like LGBT was considered a mental illness as recently as 1973, but now hardly anyone thinks of it that way anymore, even people who are opposed to it. I just saw this comment under the Youtube comments for “I, Psychopath” (the documentary about Sam Vaknin). I don’t agree with most of it, but I think it does give us something to think about in terms of autism’s relationship to psychopathy. The writer of the comment may be onto something about autism being nature’s solution to psychopathy. There does seem to be some kind of correlation between psychopathic/narcissistic parents and children with Aspergers or autism. I don’t know if any study has ever been done on this. I do not think Vaknin has Aspergers syndrome (which I was informed today is no longer called that–the updated DSM now identifies Aspergers as “autism spectrum disorder.” I prefer “Aspergers” so I will continue to use it) I think his schizoid traits make him seem like someone with Aspergers at times. Vaknin is a very important figure in terms of how his introspection allows us to see what is really happening in our evolution. After a few years reading about narcissism and psychopathy, as well as Autism, and coming to the conclusion that Autism is nature’s solution for psychopathy (I am an autists born in a family that is experiencing this transition), to my eyes, Vaknin seems to embody the bridging that is occurring. One thing that seems to be a reality is that autists may be born into families where we also find psychopathy, most likely a generation or two back. The shift to the emotional awareness presenting in the burgeoning of the enteric brain, which incorporates genetic changes changing the heart itself into a motor for cognition is what informs Autism, but because many autists are so sick or dysfunctional, it is hard to get people to see that it could have any evolutionary logic behind it. Perhaps the dysfunction is nature’s way of keeping the tremendous emotional authenticity and power it brings under wraps. Can a narcissist also be on the autism spectrum? The topic this commenter raised brings me to something I’ve been wanting to write about for awhile now: can a narcissist also be autistic or Aspie? 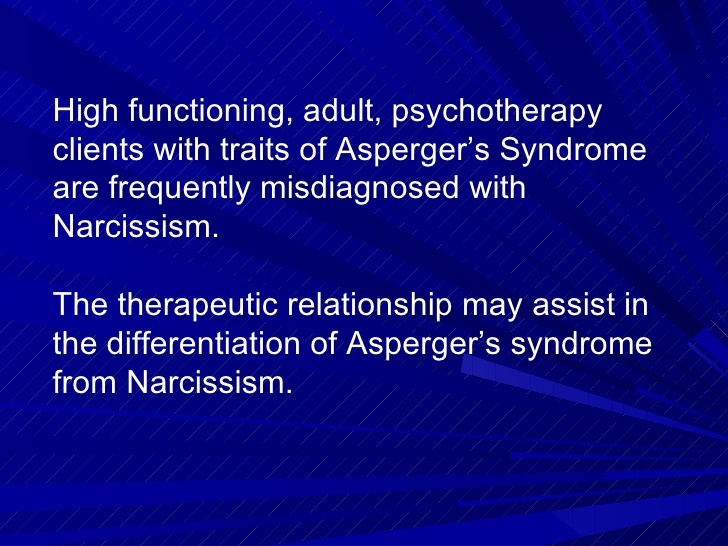 This is a tricky question, because the way I see it, autism (Aspergers) is like a mirror image of narcissism. Although people with Aspergers have been accused by many of lacking empathy (which I disputed in this blog post), they generally do not. The reason they may seem unempathic is because they don’t express their emotions very well, but most Aspies are very sensitive to the feelings of those around them and can be easily overwhelmed. Conversely, a narcissist can’t feel the emotions of others well, but is usually good at pretending they can. An Aspie is not capable of pretending to be something they are not. 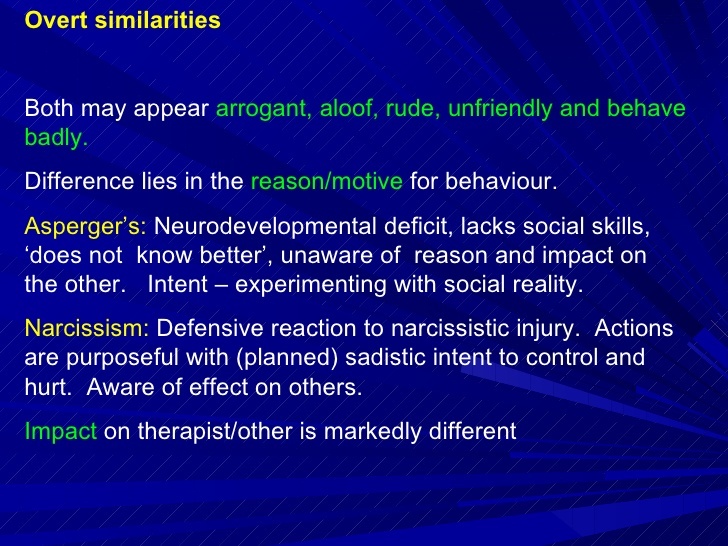 So a narcissist may seem more empathic than an Aspie, even though the opposite is the case. So can someone be both?